1年1M簽下31歲的OF/DH Jonny Gomes，出身加州的他打了九年大聯盟(TB CIN WSN)，這是他第一次加盟家鄉球隊。他不在意Coliseum是座有利於投手的球場 "I'm a guy who, when I get it, it's going to go." Non-roster invitees: Who are these guys? "I am super happy because it's been a dream of mine for a long time," Cespedes told MLB.com from the Dominican Republic. "To leave my country and play in the big leagues is what the goal was. My family is really happy, too. They are living their dreams through me." 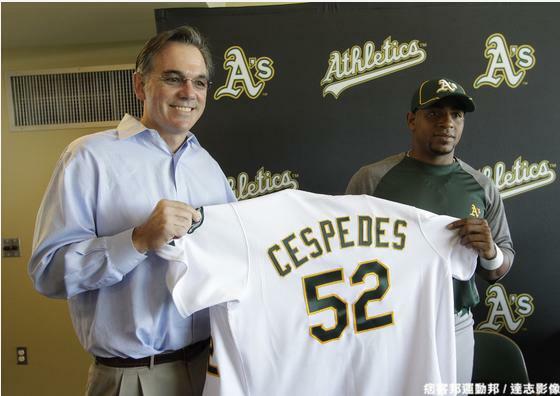 Inbox: What will Cespedes' impact be on A's? "I like him," Crisp said. "He's a great teammate, he's cool, he works hard, he's just eccentric. He's different. All of the great players are quirky in one way or another. Manny is an awesome person, nothing but pleasant and fun, but the negative stuff always captures people's attention more than the positive things. I think the positive outweighs the negative, and I love the quirky guys. They're entertaining. No filter - that's exciting." 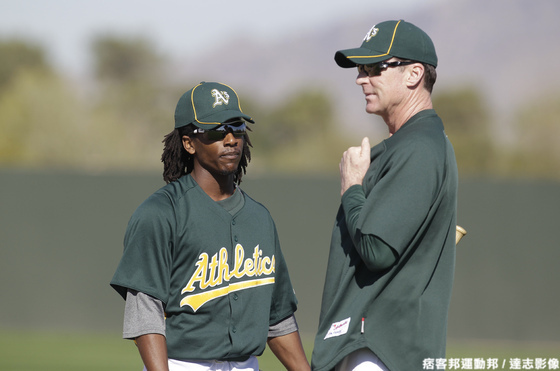 McCarthy說"We have the potential to be a 60-win team and the potential to be a 90-win team,"
Jonny Gomes之前跟他同隊過。Kurt說"Manny ranks as one of the greatest hitters ever,"，放在打線中間，讓他附近的人都變的更好 "You put a guy like that in the middle of your order, and it makes everyone around him better." FDLS上看99麥的速球讓他常常被認為會接下Bailey的位置，總ㄟ提到"closers have one special pitch. [Mariano] Rivera has the cutter, [Trevor] Hoffman had the changeup, and for him it's the exploding fastball." Of course I can see that, but I'm not going to be happy with that "I don't think anybody should be happy with anything less than what they want," he said. "Obviously you have to make adjustments accordingly. That's just life. You're not always going to get what you want, but you strive to get that, and that's what I'm going to be out there trying to do." "Sometimes you don't appreciate what you have until you lose it, and that's what happened to me," he said. "Everyone knows my story. ... Now, I'm at peace." "I pushed him from day one," she said. "I said, 'Baby, go back. You can't finish your career like this. This can't be your legacy. If you're going to exit, exit right.' He is doing this for our whole family, to show if you make mistakes, you get up and you face it, and you change. 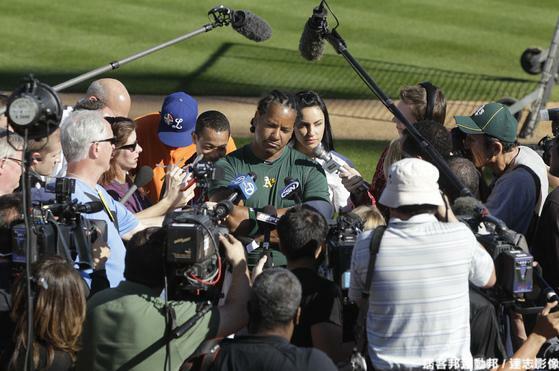 "I thought I would lose my family and my career," Manny Ramirez said. "It was not easy. ... Sometimes when you don't got God in your heart, you do stupid things without thinking about it. When you start going to church, it's like you open your eyes and you realize it doesn't matter how much money you have, nice house, nice cars. If you don't have God in your heart, it doesn't mean anything. "Half the guys were probably wondering, 'Who the hell is that old guy?' " Wolff said with a smile. "It was fun." "Bob knows I love to play every day,""I didn't mind that. I liked it," Suzuki said. "I'll try anything if it will help me. I don't want to settle for being an average catcher. I want to be the best and get the best out of my ability. "I'm not the biggest guy in the world, but with this weight gain, I just feel better. The way I'm hitting, the way I'm throwing, everything is better. I'm not the most talented guy out there, but getting the most out of my body puts me in position to be the best." "That organization gave me a start when I was a little kid in the Dominican, they opened the doors for me." "It is, I know it," Timmons said. "I'm not a prototype third baseman, but could I play third base every day in the big leagues? I think so. Am I going to hit 30-35 home runs? No. I think if you give Scott 500 at-bats, he's more that kind of player." "Was I excited to be demoted to Double-A at the age of 32? Of course not," he said. "But my job is to honor my contract. I called home and talked to my wife and we decided it was my duty." "Today, anything in the air to right field winds up being a home run." 讓Manny每兩天出賽，總ㄟ說需要給他固定的打數讓球隊了解他的狀況，Manny愛死了綠帽的白鞋，覺得那相當美麗。"My friends call me and say, 'You look so good in green!' "
"I was looking at another surgery, another offseason of rehab," Doolittle said. "I thought, 'What am I doing?' "
總ㄟ被問到FDLS "He's a guy who has a ceiling to close at some point. I don't know if it's now." "You know who had the lead in switch-hit homers in the same game before (Mark) Teixeira?" Davis asked. "It was me." 能不能擠進25人，要看FO。"I'm just trying to play as hard as I can and help this team win." I'd take [the closer's demeanor] in the fifth inning if I had to. That's just the way it is." Fuentes said he was disappointed that he lost the closer competition but that he'd be ready to take on the setup role he'll now be slotted into. "He has the stuff, that's for sure," Fuentes said. "Everybody who's watched him do it for the last four or five years, the way he's pitched has been at a high level and very effective. And I'll be there to help him if he needs help, or talk about it or whatever. But I think he can do it."